Hugger ceiling fans are defined as ceiling fans which include no downrod and are mounted flush to the ceiling. This is why they are often interchangeably referred to as flush-mount ceiling fans and are a great choice for low ceilings or small rooms. Hugger ceiling fans are also often lumped together with low profile fans, but these are slightly different as discussed below. These compact fans not only fit into small rooms but can be purchased with many different features. Just because you have a small room and a low ceiling does not mean you are out of options, or are “option limited.” There are a variety of styles and brands of hugger ceiling fans which are sleek, and help to optimize the space you have. To make shopping easier, we have developed a list which showcases the best hugger fans from different categories. 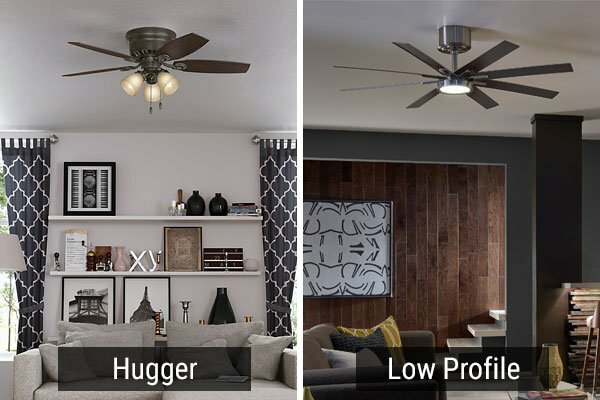 We have even highlighted the “huggiest hugger,” or the lowest profile ceiling fan available, which is both the smallest and the shortest. If you are looking for a fan to truly be as small and compact as possible, the Quorum Custom Hugger 42-inch ceiling fan is our “huggiest hugger,” as our Customer Experience Manager would say. 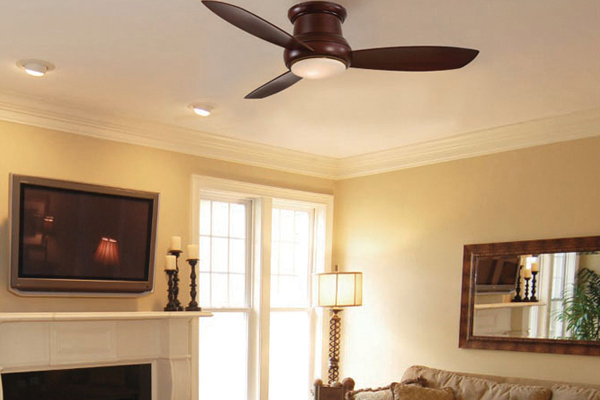 This flush-mount option is only 7.5 inches from the ceiling to the bottom of the fan, and it has an 11-inch base. The Quorum Custom Hugger is available in four different finishes. For a slightly larger fan, you can order the Custom Hugger in a 52-inch span. This only hangs a quarter of an inch lower. 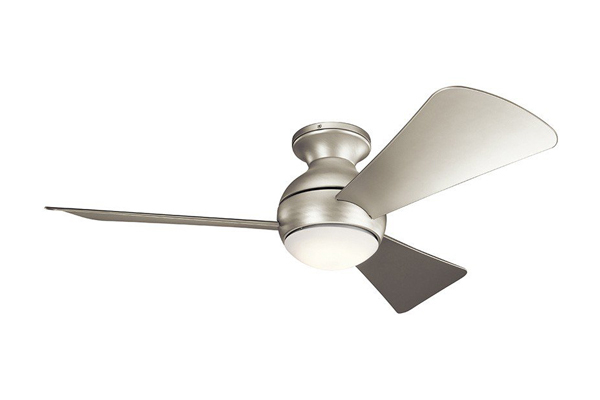 When looking for a smaller ceiling fan, the 42-inch Kichler Stratmoor is a wonderful option to consider as it is only 8.25 inches from the ceiling to the bottom of the fan, yet still has an impressive 4,098 CFM rating. The Stratmoor comes in four different finishes and has five blades with a 12-degree blade pitch. It can also easily cool an area of 225 to 400 square feet. 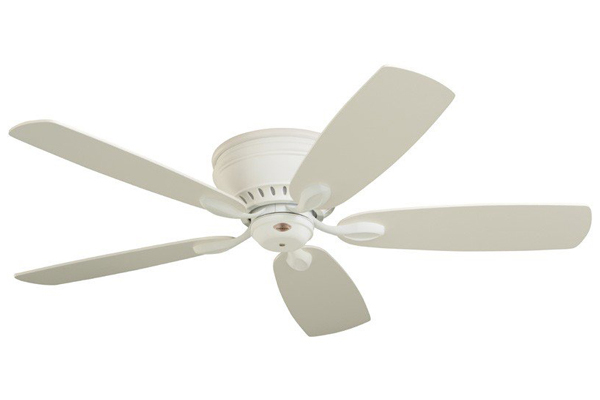 Medium ceiling fans are typically considered ceiling fans with blade spans between 44 and 50 inches. 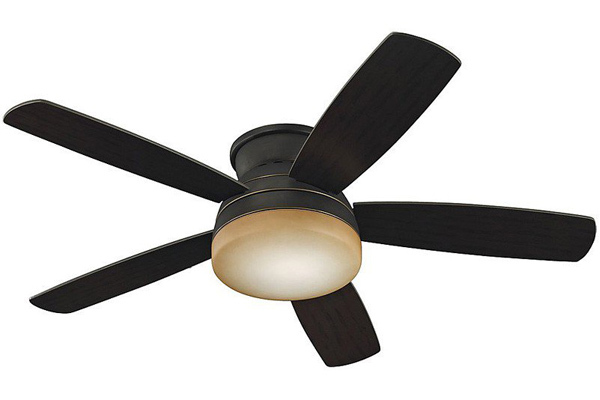 This size fan would typically work best in a room 144-225 square feet (or between 12' x 12' and 15' x 15'). The Craftmade Tempo Hugger houses a 16 watt LED, dimmable light and is 10.43" inches from the ceiling to the bottom of the light. The Tempo also comes with a three-speed remote, and is available in three finishes (Chrome, White, Oiled Bronze, Brushed Policed Nickel, and Satin Brass) and a larger blade span of 52". It is a great choice and brings contemporary style. 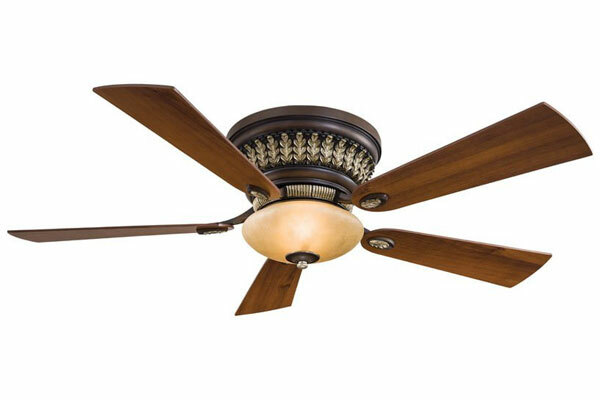 For large ceiling fans, with blade spans ranging from 52 inches to 60 inches, we recommend another great Monte Carlo fan. The Monte Carlo Traverse has a 52-inch blade span and is also available in three different finishes. The Traverse has a light covered by matte opal glass, but also, comes with a cap for non-light use. The Monte Carlo Traverse is 12 inches from the bottom of the light to the ceiling. For a hugger which not only includes lighting, but highlights it with sheer elegance, we recommend the Minka-Aire Calais. The Calais features five dark walnut blades with a 14-degree pitch, and two 60-watt candelabra base lights housed by aged champagne glass. The Calais is 12 inches from the ceiling to the bottom of the light and is a great embodiment of traditional Tuscan style. If lighting is not necessarily a concern, and you would prefer no lighting on your hugger, there are many options for flush-mount ceiling fans without lights. A great choice, in particular, is the Emerson Prima Snugger. The Prima Snugger is available in four different finishes and has a four-speed wall control with a reverse switch on the motor. 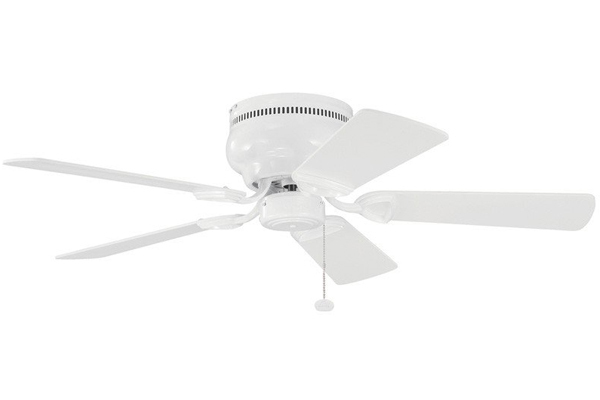 This hugger ceiling fan is 8 inches from the ceiling to the bottom and has a 5145 CFM rating. Creating a comfortable and creative outdoor area is a priority for many homeowners. Whether it’s your patio or front porch you are looking to cool down, an outdoor hugger ceiling fan can help you to save space and add a stylish focal point. The Kichler Sola is available in three different sizes, 38, 44, or 54-inch, and three different finishes, Matte White, Brushed Nickel, and Aged Bronze. With a UL-rating of "Wet", this fan can be placed anywhere outside, such as a gazebo or lanaii, and last for years! Indoor ceiling fans are essential for keeping a home cool in the summer and warm in the winter. Choosing a smaller indoor ceiling fan doesn’t mean that circulation will be minimal. 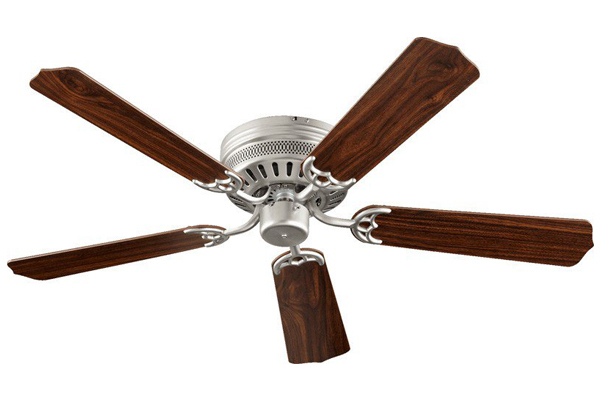 The Minka-Aire Concept II 52-inch ceiling fan has a CFM rating of 5,710. This means it can cool down rooms between 225 to 400 square feet. The Concept II has a dimmable light, five different finishes to choose from, and is 11 inches from the ceiling to the bottom of the fixture. Shopping on a budget, or working to reduce your spending, shouldn’t have to mean sacrificing quality. 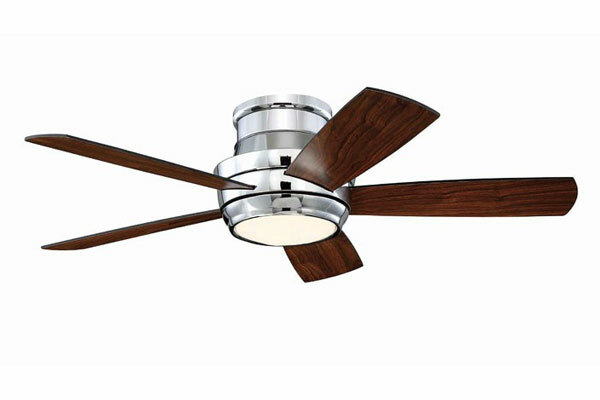 For under $100, the Hunter Builder Low Profile 42-inch ceiling fan is available in three finishes, comes with five blades, and three lights. From the ceiling to its lowest point, this fan is only 14.6 inches. The Builder houses a WhisperWind motor making it a very quiet option. If you are looking for a small and short ceiling fan, but not necessarily a flush-mount ceiling fan, there is something key to note; All hugger or flush-mount ceiling fans are low-profile fans, however, but not all low-profile fans are huggers or flush-mounts. In short, a low-profile fan is any fan which can be mounted and hang below 12 inches. Another clarification is that low-profile ceiling fans may include a downrod, while huggers do not. This means, even if a hugger fan isn’t necessarily what you are looking for, there are plenty of low-profile options for your home!